This week I'd like to finish my news report from the Corfu summer school on quantum gravity. You'll hear how strings meet loops in BF theory, and how the Poincaré 2-group gives a spin foam model that mimics flat Minkowski spacetime. But first: Timurid tiling patterns with 5-fold and 10-fold quasisymmetry, and the astronomy pictures of the week! If you listen to the news, you probably heard that NASA discovered an enormous diffuse ring around Saturn. They did it using the Spitzer Space Telescope, a satellite equipped with a telescope that detects infrared light. In "week243" I showed you infrared light from the first stars in the Universe, and in "week257" I talked about magnesium and iron oxide dust emanating from the Red Rectangle. Both of those were discovered using the Spitzer. 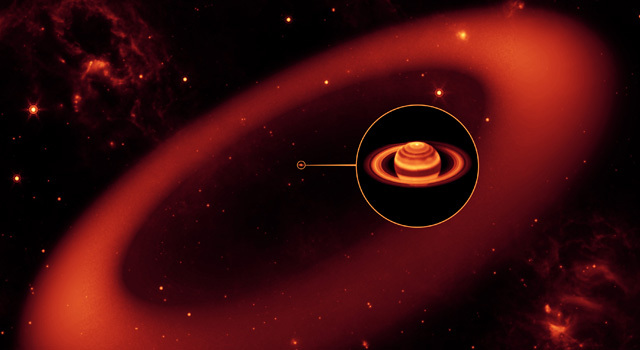 3) Anne Verbiscer, Michael Skrutskie, and Doug Hamilton, Saturn's largest ring, Nature, October 7, 2009. 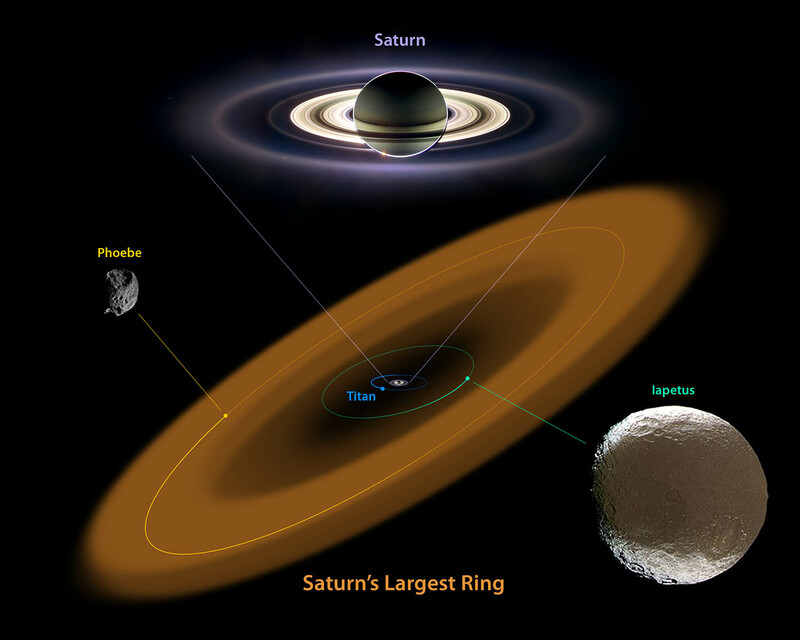 The point is that this ring surrounds the orbit of Saturn's moon Phoebe - a meteor-scarred hulk 100 kilometers across. While Phoebe looks like an asteroid, it's probably an interloper from the outer Solar System, because it's made of ice... but it's covered with a layer of dark material. What's really exciting about this new ring is that it explains one of the big mysteries of the Solar System: the dark spot on Saturn's moon Iapetus! 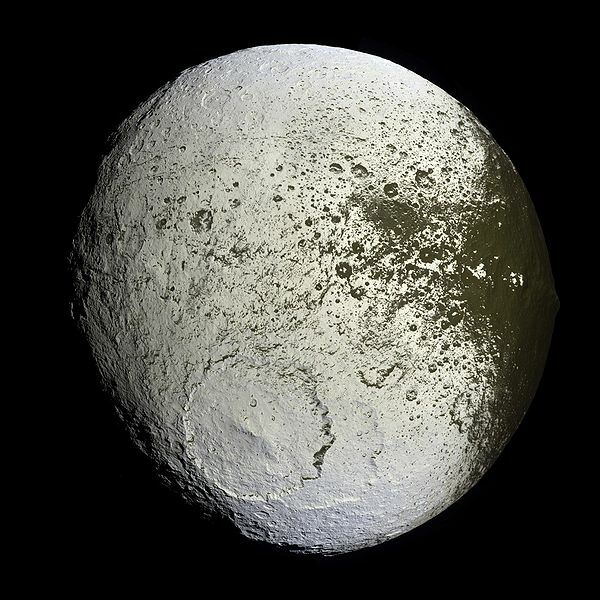 Iapetus is mostly icy, but one side is covered with dark stuff... probably cyanides and carbon-rich minerals. Now it seems this stuff was picked up from the newly discovered ring! It seems to have landed in lumps - mainly on the leading side of Iapetus. You see, this moon is locked in synchronous rotation with Saturn, just like our Moon always shows the same face to Earth. So, one side plows through space and picks up debris, while the other stays clean. 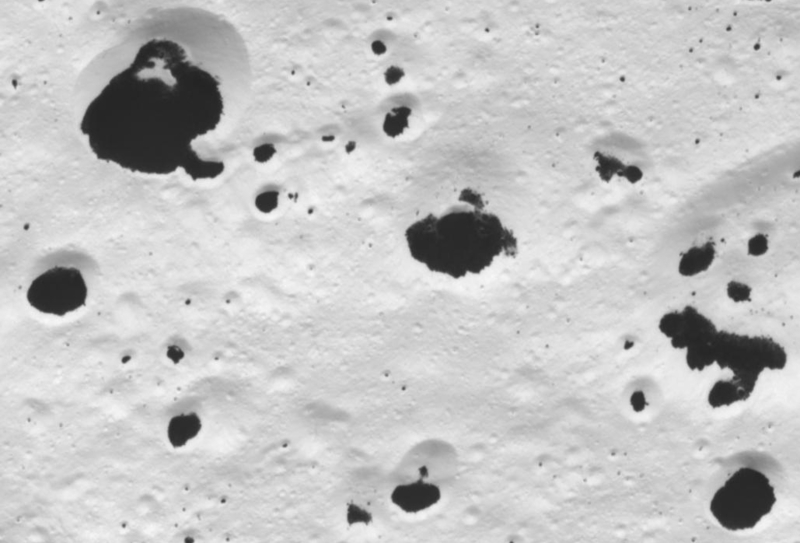 As you can see, in this region of Iapetus the dark stuff is found at the bottoms of craters. It could have formed these craters by impact, but its presence could also gradually make these craters deeper: the dark stuff should absors more sunlight and warm the nearby ice, making it "sublimate": that is, turn into water vapor. Because it's locked in synchronous rotation with Saturn, the "day" on Iapetus is equal to one period of rotation, namely 79 of our Earth days. So, it's probably the warmest place in the Saturnian system during the daytime. Not very warm: just 113 kelvin on the ice. That's -160 °C! But in the dark regions it should be about 138 kelvin. This extra warmth should make more ice sublimate, making them even darker. It's been estimated that over one billion years the very dark regions would lose about 20 meters of ice to sublimation, while the light-colored regions would lose only 10 centimeters, not even counting the ice transferred from the dark regions. So far, it's a cool result but it's sort of like stamp collecting - we discovered a new X and described it, done. Where the paper gets really interesting is when the authors explore what happens to the particles in Phoebe's ring over time, something that you can model by writing down a few equations that describe the orbit of a particle, include Saturn, Phoebe, Iapetus, and Titan, include the masses, densities, and albedos of the particles, and the effects of incident sunlight. What happens to particles depends upon their size. The biggest chunks, several centimeters in size or larger, don't really migrate anywhere, sticking around near Phoebe's orbit until they smack into something - each other or Phoebe. The model simulation suggests that it would take more than the age of the solar system for half of the particles to be removed from the system by re-collision with Phoebe, so most of the biggest chunks are still out there somewhere in Phoebe's orbital space. What about smaller particles? The article says "re-radiation of absorbed sunlight exerts an asymmetric force on dust grains, causing them to spiral in towards Saturn with a characteristic timescale of 1.5 × 105 r years, where r is the particle radius in micrometers. This force brings all centimetre-sized and smaller material to Iapetus and Titan unless mutual particle collisions occur first.... Most material from 10 micrometres to centimetres in size ultimately hits Iapetus, with smaller percentages striking Hyperion and Titan." This would be a slow process that has operated continuously since whenever Phoebe was captured into Saturn's orbit. 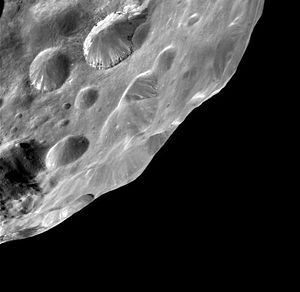 There might have been bursts of material delivered to Iapetus associated with some of the bigger impacts that have left such large scars on Phoebe, but they would have been blips above a steady background. This program generates quasiperiodic tilings with approximate 10-fold rotational symmetry using a method called "inflation". The idea of inflation is to take a collection of tiles and repeatedly subdivide each one into smaller tiles from the same collection. Egan's applet shows the process of inflation at work: patterns zooming in endlessly! Some of the math behind this is modern, but some goes back to the Timurids: the dynasty founded by the famous conqueror Timur, also known as Tamerlane. By 1400, the Timurid empire was huge. It included most of central Asia, Iran, and Afghanistan, as well as large parts of Pakistan, India, Mesopotamia and the Caucasus. Its capital was the magical city of Samarkand. The Timurids raised the art of tiling to its highest peak. 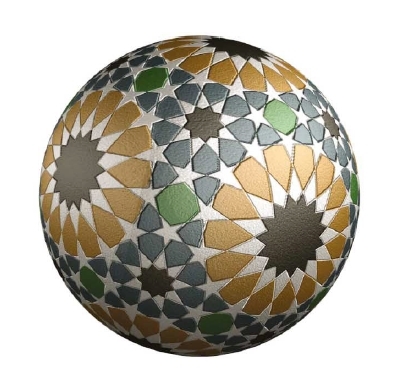 Islamic artists had already explored periodic tilings with most of the 17 mathematically possible "wallpaper groups" as symmetries - for more on this, see my tour of the Alhambra in "week267". What was left to do? Well, periodic tilings can have 2-fold, 3-fold, 4-fold, or 6-fold rotational symmetry, but nothing else. Notice the gap? It's the number 5! So that's what they tackled. Precisely because you can't produce periodic tilings with 5-fold rotational symmetry, it's a delightful artistic challenge to fool the careless eye into thinking you've done just that. kite: a convex quadrilateral with interior angles of 2π/5, 2π/5, 2π/5 and 4π/5 as you march around it. dart: a nonconvex quadrilateral with interior angles of 2π/5, π/5, 6π/5 and π/5. 7) Peter J. Lu and Paul J. Steinhardt, Decagonal and quasi-crystalline tilings in medieval Islamic architecture, Science 315 (2007), 1106-1110.
a regular pentagon with five interior angles of 3π/5. a regular decagon with ten interior angles of 4π/5. a rhombus with interior angles of 2π/5, 3π/5, 2π/5, 3π/5. an elongated hexagon with interior angles of 2π/5, 4π/5, 4π/5, 2π/5, 4π/5, 4π/5. a bow tie (non-convex hexagon) with interior angles of 2π/5, 2π/5, 6π/5, 2π/5, 2π/5, 6π/5. There are lots of ways to fit them together. The rhombus can be subdivided into a kite and a dart, too! 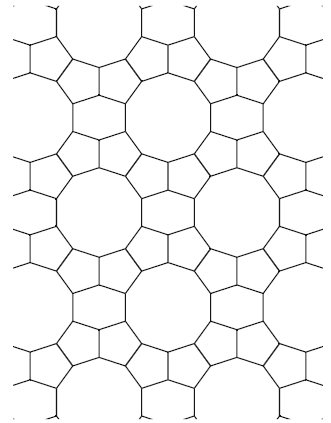 Lu and Steinhardt call them "girih tiles". But "girih" actually means "strapwork": the braided bands that decorate the tiles in a lot of this art, as shown rather crudely in the picture above. Egan's applet uses three of these tiles: the decagon, the elongated hexagon and the bowtie. As you'll see on his webpage, each can be subdivided into smaller decagons, hexagons and bowties. And that's how "inflation" works. Did the Timurid artists actually understand the process of inflation, or the idea of a quasiperiodic tiling? Seeking clues, scholars have turned to the Topkapi Scroll, a kind of "how-to manual" for tiling that resides in the Topkapi Palace in Istanbul. 8) Gulru Necipoglu and Mohammad al-Asad, The Topkapi Scroll - Geometry and Ornament in Islamic Architecture, Getty Publications, 1996. The Mathematical Intelligencer is a wonderful magazine put out by Springer Verlag. It's recently become available online - and to my shock, the above article is free! Springer doesn't give much away, so I can't help but fear this is an oversight on their part, soon to be corrected. So, grab a copy of this article now. Cromwell argues that we shouldn't attribute too much modern mathematical knowledge to the Timurid tile artists. But the really great thing about this article is the detailed information on how some of these tiling patterns are made - including lots of pictures. It repays repeated study. 16) Eric Broug, Islamic Geometric Patterns (book with CD-ROM), Thames and Hudson, 2008. Even if you don't have the skill or time to draw these patterns, the book is worthwhile for the pictures and explanations. I'll list a bunch more references below, for when I retire and get time to devote myself more deeply to this subject. But now - on to Corfu! Last time I said a bit about what I learned in Ashtekar and Rovelli's courses. Now I'd like to talk about some other things I learned in Corfu - some things I find even more tantalizing. In "week232", I explained how gravity in 3d spacetime automatically contains within it a theory of point particles, and how a 4d analogue of 3d gravity automatically contains within it a theory of string-like objects. This 4d theory is called BF theory. Like 3d gravity, it describes a world where spacetime is flat. So, it's boring compared to full-fledged 4d gravity - so boring that we can understand it much better! In particular, unlike 4d gravity, we understand a lot about what happens when you take quantum mechanics into account in 4d BF theory. 17) Winston J. Fairbairn and Alejandro Perez, Extended matter coupled to BF theory, Phys. Rev. D78:024013, 2008. Also available as arXiv:0709.4235. 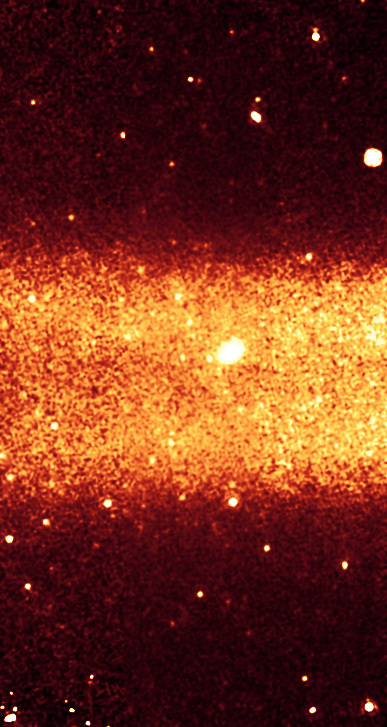 18) Winston J. Fairbairn, On gravitational defects, particles and strings, JHEP 0809:126, 2008. Also available as arXiv:0807.3188. And it turns out that if we impose the constraints on BF theory that turn it into general relativity, we obtain the usual Nambu-Goto string, where the action is the area! However, the last of the three papers above shows there are some subtle differences. I need to think about this a lot more. It was always my hope to reconcile string theory and loop quantum gravity, and this could be the way. Of course, reconciling two things that don't work doesn't necessarily give one that does. A pessimist might say that combining string theory and loop quantum gravity is like combining epicycles and aether. But I'm optimistic. Something interesting is going on here. 20) Aristide Baratin, Derek K. Wise, 2-Group representations for spin foams, to appear in proceedings of the XXV Max Born Symposium: The Planck Scale, Wroclaw, Poland. Also available as arXiv:0910.1542. In "week235" I mentioned an amazing paper by Baratin and Freidel called "Hidden quantum gravity in 4d Feynman diagrams: emergence of spin foams". They described a spin foam model that acts just like 4-dimensional flat Minkowski spacetime: couple it to interacting point particles, and you get the usual Feynman diagrams described in a new way! The big news is that this spin foam model comes from the representations of a 2-group, instead of a group. Namely, the Poincaré 2-group. This is a 2-group I invented which has Lorentz transformations as objects and translations as endomorphisms of any object. 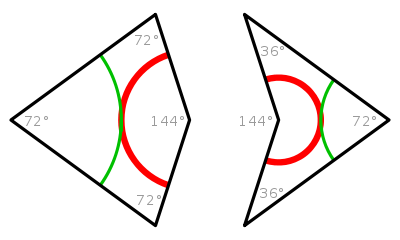 The Poincaré 2-group spin foam model was first studied by Crane, Sheppeard and Yetter. Baratin, Freidel, Wise and I spent a long time developing the theory of infinite-dimensional representations of 2-groups needed to make this model precise - see "week274" for more on all this. Now the details are falling into place, and a beautiful picture is emerging. I should admit that the paper by Baratin and Wise deals with the Euclidean rather the Lorentzian version of this picture. I hope this is merely because the representation theory of the "Euclidean 2-group" is more tractable than that of the Poincaré 2-group. I hope everything generalizes to the Lorentzian case. To wrap up, here's a big list of references from Cromwell's paper on tilings I hadn't known so much had been written about this subject! 21) M. Arik and M. Sancak, Turkish-Islamic art and Penrose tilings, Balkan Physics Letters 15 (1 Jul 2007) 1-12. 22) J. Bonner, Three traditions of self-similarity in fourteenth and fifteenth century Islamic geometric ornament, Proc. ISAMA/Bridges: Mathematical Connections in Art, Music and Science, (Granada, 2003), eds. R. Sarhangi and N. Friedman, 2003, pp. 1-12. 23) J. Bonner, Islamic Geometric Patterns: Their Historical Development and Traditional Methods of Derivation, unpublished manuscript. 24) J. Bourgoin, Les Elements de l'Art Arabe: Le Trait des Entrelacs, Firmin-Didot, 1879. Plates reprinted in Arabic Geometric Pattern and Design, Dover Publications, 1973. 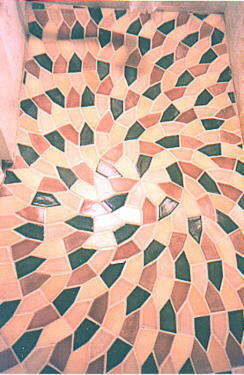 25) J.-M. Castira, Arabesques: Art Decoratif au Maroc, ACR Edition, 1996. 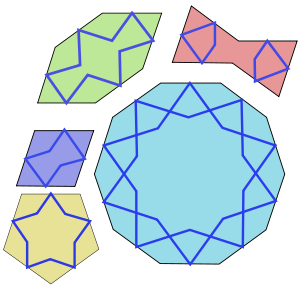 26) J.-M. Castira, Zellijs, muqarnas and quasicrystals, Proc. ISAMA, (San Sebastian, 1999), eds. N. Friedman and J. Barrallo, 1999, pp. 99-104. 27) G. M. Fleurent, Pentagon and decagon designs in Islamic art, Fivefold Symmetry, ed. I. Hargittai, World Scientific, 1992, pp. 263-281. 28) B. Grunbaum and G. C. Shephard, Tilings and Patterns, W. H. Freeman, 1987. 29) E. H. Hankin, On some discoveries of the methods of design employed in Mohammedan art, J. Society of Arts 53 (1905) 461-477. 30) E. H. Hankin, The Drawing of Geometric Patterns in Saracenic Art, Memoirs of the Archaeological Society of India, no 15, Government of India, 1925. 31) E. H. Hankin, Examples of methods of drawing geometrical arabesque patterns, Math. Gazette 12 (1925), 370-373. 32) E. H. Hankin, Some difficult Saracenic designs II, Math. Gazette 18 (1934), 165-168. 33) E. H. Hankin, Some difficult Saracenic designs III, Math. Gazette 20 (1936), 318-319. 34) A. J. Lee, Islamic star patterns, Muqarnas IV: An Annual on Islamic Art and Architecture, ed. O. Grabar, Leiden, 1987, pp. 182.197. 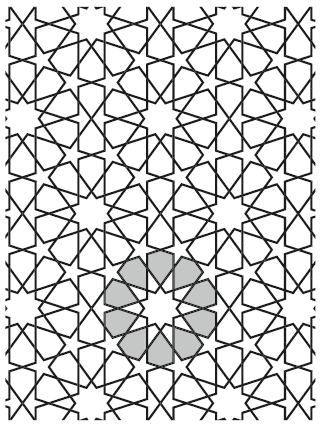 35) P. J. Lu and P. J. Steinhardt, Response to Comment on "Decagonal and quasi-crystalline tilings in medieval Islamic architecture", Science 318 (30 Nov 2007), 1383. 36). F. Lunnon and P. Pleasants, Quasicrystallographic tilings, J. Math. Pures et Appliques 66 (1987), 217-263. 37) E. Makovicky, 800-year old pentagonal tiling from Maragha, Iran, and the new varieties of aperiodic tiling it inspired, Fivefold Symmetry, ed. I. Hargittai, World Scientific, 1992, pp. 67-86. 38) E. Makovicky, Comment on "Decagonal and quasi-crystalline tilings in medieval Islamic architecture", Science 318 (30 Nov 2007), 1383. 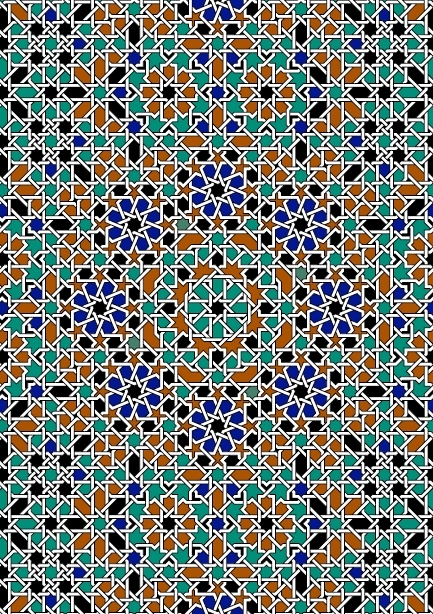 39) E. Makovicky and P. Fenoll Hach-Alm, Mirador de Lindaraja: Islamic ornamental patterns based on quasi-periodic octagonal lattices in Alhambra, Granada, and Alcazar, Sevilla, Spain, Boletin Sociedad Espanola Mineralogia 19 (1996), 1-26. 40) E. Makovicky and P. Fenoll Hach-Alm, The stalactite dome of the Sala de Dos Hermanas - an octagonal tiling?, Boletin Sociedad Espanola Mineralogia 24 (2001), 1-21. 41) E. Makovicky, F. Rull Pirez and P. Fenoll Hach-Alm, Decagonal patterns in the Islamic ornamental art of Spain and Morocco, Boletmn Sociedad Espanola Mineralogia 21 (1998), 107-127. 42) J. Rigby, A Turkish interlacing pattern and the golden ratio, Mathematics in School 34 no 1 (2005), 16-24. 43) J. Rigby, Creating Penrose-type Islamic interlacing patterns, Proc. Bridges: Mathematical Connections in Art, Music and Science, (London, 2006), eds. R. Sarhangi and J. Sharp, 2006, pp. 41-48. 44) F. Rull Pirez, La nocion de cuasi-cristal a traves de los mosaicos arabes, Boletin Sociedad Espanola Mineralogia 10 (1987), 291-298. 45) P. W. Saltzman, Quasi-periodicity in Islamic ornamental design, Nexus VII: Architecture and Mathematics, ed. K. Williams, 2008, pp. 153-168. 46) M. Senechal, Quasicrystals and Geometry, Cambridge Univ. Press, 1995. 47) M. Senechal and J. Taylor, Quasicrystals: The view from Les Houches, Math. Intelligencer 12 (1990) 54-64. The last one is a huge treasure trove of images! This one can be run in full-screen mode. Because of the content of your post, I can't help but offer a few notes about what you said. Feel free to use these any way you want, or file them away for later. 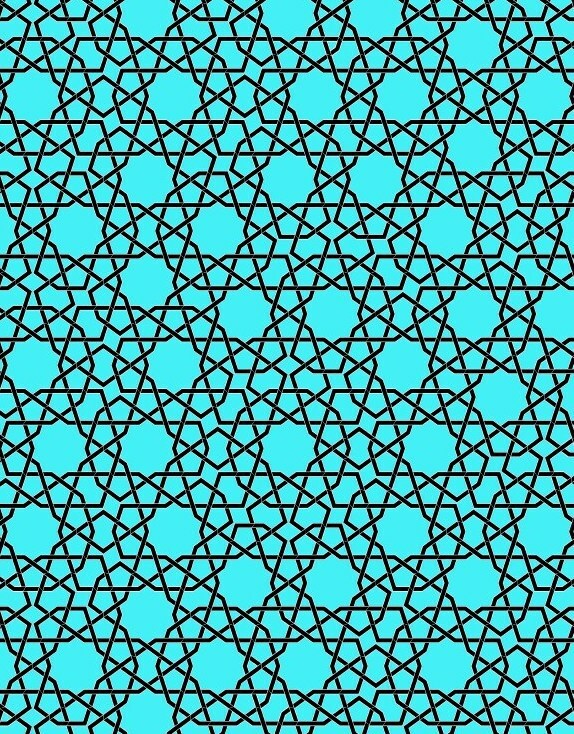 I wouldn't say that the Timurids set out to tackle fivefold tilings. They looked at a lot of geometry in general - it's not clear to me that they devoted any more energy to 5 than any other number. But they did produce amazing results! You should be aware that within the Islamic geometric art community, there's a fair amount of controversy and resentment surrounding the Lu and Steinhardt paper. First, the paper contains very strong claims that aren't supported by evidence. Even if the artisans had some understanding of inflation (which is debatable), I don't think there's any way they would have had a notion of quasiperiodicity. Second, several researchers perceive that L&S muscled their way into unfamiliar territory without really finding out what had been done before - one could argue that most of the work in their paper was well known to the community. Finally, the paper made its mark not because of the originality of its contribution, but because Science rolled out an enormous publicity machine around the paper's release. This is something that academics can't really control for, and which I still find a bit baffling. Man, I'd also love to get my hands on Necipoglu's book on The Topkapi Scroll. I knew of the book when it was in print, and didn't buy it. Islamic geometric designs from the Topkapi Scroll I: Unusual arrangements of stars. 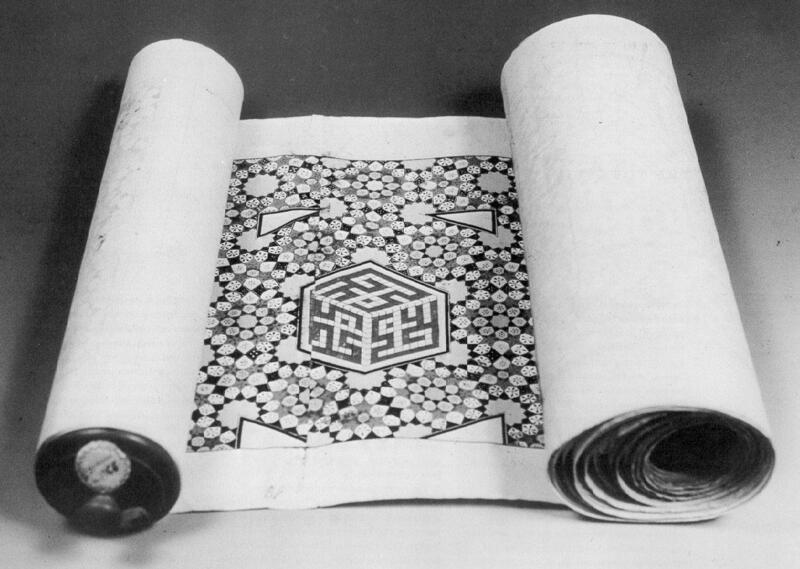 Islamic geometric designs from the Topkapi Scroll II: A modular design system. Hybrid 1-point and 2-point constructions for some Islamic geometric designs. Hopefully they'll be out soon. Hope that's useful to you, and thanks for the mention. Later Hirschhorn and Hunt extended their result to cover all non-convex equilateral tilings, but this has never been published. For more discussion visit the n-Category Café.